Aren’t these adorable? 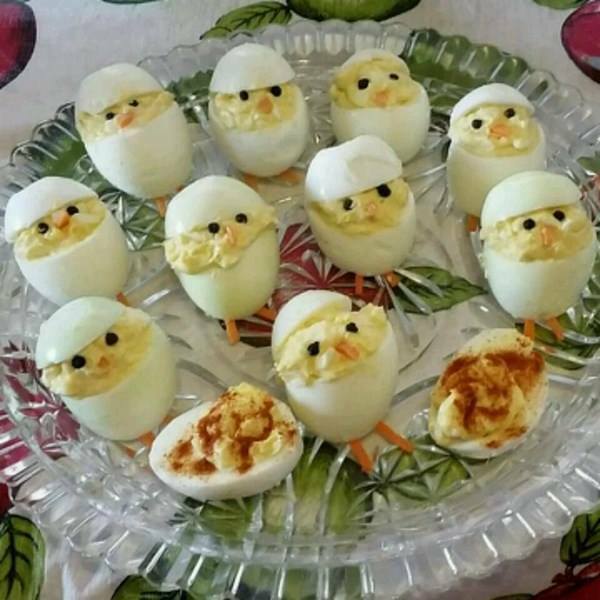 Keto approved Easter deviled eggs. These are perfect for the whole family. A healthy appetizer for an Easter get together you are going to! These are so cute! I love making these at Easter time because they are low carb, keto approved and delicious! 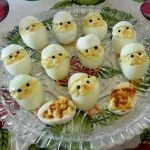 They are perfect if you want to take a healthy appetizer to your Easter party or get together. Everyone loves these because they are so adorable! They taste amazing! You can also let the kids help make these because they are so easy! Great for a craft on Easter weekend. They are so much fun to make! Slice through the top 1/3 of each cooked egg, ensuring some of the yolk is included in the slice. Carefully remove the egg yolk from the bottom portion of the egg using a spoon and transfer to a bowl. Mix egg yolks, mayonnaise, mustard, pickle, horseradish, pickle juice, salt, and pepper together in a bowl. Fill a piping bag or a plastic bag with a corner snipped with the egg yolk mixture. Pipe egg yolk mixture into the hollowed egg whites creating the chick, ensuring there is enough filling to add eyes and a beak. Slice small wedges out of the carrot rounds creating 12 beaks. Add a beak to each chick. Slice olive pieces into small squares to be used as eyes. Add 2 eyes to each chick. Place the egg tops onto each chick to look like a chick peaking out of the egg.